It would be easy to dismiss Microsoft's Surface Pro as an "also ran" in the mobile category, but that would overlook how the natural evolution of tablets is bringing the competition back to Microsoft. As much as Microsoft has failed to connect with mobile technology, they are still the clear leaders when it comes to the enterprise. And as the Microsoft Surface has evolved, it has become entrenched as one of the go-to hybrid tablets. This is despite the fact that it doesn't actually come with a keyboard. But is it as good as an iPad Pro? Rather than look at specs and compare benchmarks, let's just jump straight to the number one deciding factor between the Surface Pro and the iPad Pro: Apps. Most of us don't buy a computer just to brag on its speed. When all is said and done, what we really care about is what we can do with it. And that decision is based on the software we can run on it. The Surface Pro runs a full version of the Windows software, which not only gives it more customizable features and access to a very open file system, it also has access to more powerful software. This shouldn't be surprising as Windows has been around for decades. This gives it access to more robust features in Microsoft Word and Excel and the full-blown version of Adobe Photoshop. Where the iPad Pro shines is having apps that are specifically designed for a touch-based computer. While Windows has been accumulating software over the last few decades, much of the software that runs on Windows expects you'll be using a mouse or touchpad. This might not be as big of a deal while using the Surface Pro's smart keyboard, which includes a touch pad, but the entire reason to buy a Surface Pro is to also use it as a tablet. And not all software will run as smoothly when you are using your fingers. Ultimately, the question of software will come down to the question of need. If you absolutely need to use software that is only available on the Windows platform, then the question of which device is 'better' becomes moot. You will need a Windows-based device. But many people may be surprised at just how much they don't need Windows these days. Not only is the App Store filled with some great alternatives, we are able to do a lot more in our web browser these days. And while Windows still has a definite advantage in the enterprise, at home, the iPad has become king. With the recent ransomware attacks, security is becoming more and more of a priority. The idea that your computer can be hijacked and your files held for data should be enough to cause anyone to worry. In terms of malware like viruses and ransomware, the iPad is a much more secure device. While Windows offers more flexibility in terms of an open file system, this very same features makes it more vulnerable to attack. The iPad places each app -- and that apps' documents -- in its own environment that cannot be directly accessed by any other app. This means the iPad cannot be infected by a virus and the files on the iPad cannot be held hostage. The curated App Store is also a boon for those worried about security. While it is possible for malware to slip past the App Store police, it is very rare, and it is often caught within weeks. The biggest malware threat to the iPad comes through the web browser where a web page may pretend to hold the iPad hostage, but these 'attacks' are thwarted by simply closing the web page or closing out of the web browser. How does the 2017 iPad Pro compare to the Surface Pro "5" in terms of performance? It's easy list out a bunch of technical specifications and benchmarks, but in truth, specifications don't matter as much when comparing a device running a mobile operating system with another device running a desktop operating system. The Surface Pro is also more of a laptop than a tablet, with options allowing you to upgrade the processor, amount of RAM memory, storage, etc. At the top end, the 2017 Surface Pro runs on a super fast i7 processor, includes 16 GB of RAM memory for applications and has 1 TB of SSD storage. It also has a $2,699 price tag, which means you could buy three iPad Pros and still have some money left over. And while the top end Surface Pro is overkill for most people, the low end is underkill, especially considering the $799 entry price. This Surface Pro is costs the same as the entry-level 12.9-inch iPad Pro, but A10x processor in the iPad Pro will run circles around Intel Core m3 in the low-end Surface. Here's where it gets interesting. The 4 GB of RAM memory on the iPad Pro gives plenty of elbow room for apps and makes multitasking very smooth. The same 4 GB of RAM on that entry-level Surface Pro will slow the whole tablet down even with only a single piece of software open. This is where the differences in the operating systems plays a huge role. The same can be said for the amount of storage. The 128 GB in that low-end Surface may sound like a lot compared to 32 GB on the iPad Pro, but ultimately, it will be much more cramped. Simply put, software on the Surface Pro will take up more room than on the iPad Pro. If you are thinking about going with the Surface Pro, you will want to target the Intel Core i5 with 8 GB of RAM and 256 GB of storage at a minimum. This brings the cost up to $1,299, but ultimately, it will give you a couple of more years of use compared to the lower-end model, which will make up for the price difference. This model also compares well to the iPad Pro. The iPad Pro may have more raw processing power, but the Intel Core i5 processor should be enough for most people. The next step up the ladder is the i7 Surface Pro, which costs $1,599 but should run a little faster than the newest iPad Pro. How about the extras? How good does the Surface Pro look compared to the iPad? One thing Apple consistently does a great job of is pushing the boundaries of the display. When they introduced the "Retina Display", they revolutionized high density pixels in our mobile devices. Now most smartphones and tablets are crystal clear. Apple did it again with the 9.7-inch iPad Pro introduced in 2016. The "True Tone" display offers a wide gamut of colors that supports Ultra HD. It also alters the colors on the screen based on ambient lighting to give it a more realistic reaction when transitioning between sunlight, indoor lighting or shade. And the 2017 iPad Pro models take this a step forward by displaying 600-nit level of brightness, which basically means the Pro's screen can display more light, which results in a better picture. The 12.9-inch and 10.5-inch iPad Pro models easily win the display award, but in truth, you probably wouldn't notice it unless they were held side-by-side with the Surface Pro, which has a very good display as well. The iPad Pro also comes with a better set of cameras. The iPad's 7-megapixel front-facing camera is slightly better than the Surface's 5-megapixel camera, but it is the back-facing camera that really sets the iPad Pro apart. The Surface Pro has an 8-megapixel back-facing camera capable of shooting HD video, while the 2017 iPad Pro models have a 12-megapixel camera similar to the one found on the iPhone 7. It is also capable of shooting 4K video. What about the keyboard and the stylus? A big focus of Microsoft commercials showing off the Surface tablet is the smart keyboard that connects to it. Unfortunately, while the keyboard connects great with the Surface Pro, it doesn't come with it. And while the Surface Pro 4 came with the Surface Pen, the 2017 Surface Pro doesn't come with either of these accessories. The odd part here isn't so much that the Surface Pro doesn't come with a keyboard or stylus as it is that Microsoft makes such a big deal of having those options. 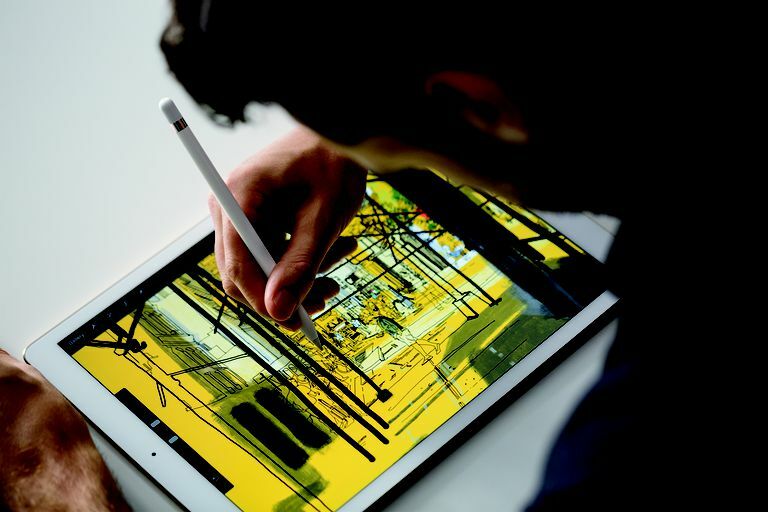 The iPad Pro also has a smart keyboard and the Apple Pencil, which is a high-tech stylus. Neither of those comes with the iPro Pro, but similar to the Surface Pro, they can make great accessories. Overall, I would recommend skipping the smart keyboard when making your initial purchase. You might be amazed at just how much you can get done using only the on-screen keyboard. If you require a lot of typing, the smart keyboards can be a good addition, but if you balk at spending $150 for a keyboard, don't buy them. Both the Surface Pro and the iPad Pro will work with most bluetooth keyboards. The same goes for the stylus. While artists will want to buy them immediately, most of us will find a cheap stylus will work just as well for our modest needs. Is the iPad Pro the better deal? Or is the Surface Pro ultimately cheaper? The entry-level 10.5-inch iPad Pro starts at $649, which is $150 cheaper than the entry-level Surface Pro. However, this isn't exactly an even comparison. The iPad Pro is much faster than the Intel Core m3 Surface Pro, but the Surface Pro has a larger 12.3-inch display. The fairest comparison is the Intel Core i5 Surface Pro with 8 GB of RAM and 256 GB of storage to the 12.9-inch iPad Pro with 256 GB of storage. The iPad Pro may end up being faster and has a slightly larger display, but they are both pretty close in specs... except for the price. The iPad Pro with this configuration costs $899, which is a pretty big savings compared to the $1299 Surface Pro. Apple has long been known for having rather steep prices for their line of laptop and desktop prices, but the iPad has consistently been one of the best deals in tech since its release. Every release seems to raise the bar in terms of performance in a laptop, and the price remains under $1000 for most models. If you are still on the fence, the simplest way to make a choice is to decide what you are most looking for in a device. If you mainly want a laptop, the Surface Pro 4 with the additional smart keyboard will offer the benefits of a laptop (including running Windows software) that can also be used as a tablet. On the other hand, if you are mainly wanting a tablet, the iPad Pro will offer the absolute best tablet experience at a more affordable cost. And you can pass those savings on to the purchase of the smart keyboard to make the iPad Pro a very capable laptop as well. But the biggest factor is Windows vs iOS. Even if you like the better security and cheaper price tag of the iPad Pro, if you absolutely must use software that only runs on Windows, the Surface Pro is the only choice. If open access to files or plugging in flash drives is a big deal, the Surface Pro wins. But if you aren't tied to Windows software, the iPad Pro provides more power at a cheaper price, has a better display and has superior cameras.